Secretary of State welcomes North Korea’s recent restraint, says talks with Pyongyang may be possible "in the near future". U.S. Secretary of State Rex Tillerson on Tuesday welcomed North Korea’s recent “restraint”, adding talks with Pyongyang may be possible "in the near future". Speaking to reporters and quoted by AFP, Tillerson made a point of acknowledging that Kim Jong Un's regime has not carried out any new nuclear or ballistic missile tests since the UN Security Council imposed a new round of tougher sanctions last month. "I am pleased to see that the regime in Pyongyang has certainly demonstrated some level of restraint that we've not seen in the past," he was quoted as having said. "We need to see more on their part, but I want to acknowledge the steps they've taken thus far. 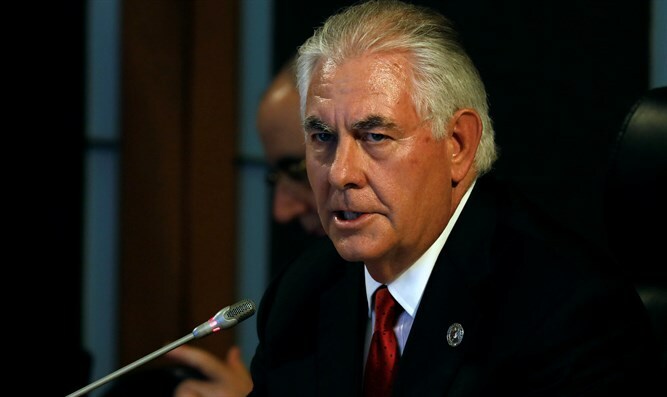 I think it's important to take note of that," added Tillerson. U.S. officials told AFP that the Secretary of State was not thanking Pyongyang, nor making any concession on Washington's determination to halt Kim's missile program and negotiate the denuclearization of the Korean peninsula. But they said he did want to note what the U.S. administration sees as a lowering in immediate tensions, in the hope that the isolated regime will see an opening that could lead to dialogue. Last week, Tillerson said that the United States was still interested in talks with North Korea, but put the onus on North Korean leader Kim Jong Un. "We continue to be interested in trying to find a way to get to dialogue, but that's up to him," he told reporters. Tensions have increased between the United States and North Korea in recent weeks. Later, North Korea toned down the rhetoric and Kim said the attack on Guam would be put off while he watches U.S. actions. On Tuesday, Tillerson suggested that progress can now be made. "I think it is worth noting that we have had no missile launches or provocative acts on the part of North Korea since the unanimous adoption of the UN Security Council resolution," he said, adding, "And I want to take note of that. I want to acknowledge it." "We hope that this is the beginning of this signal that we've been looking for -- that they are ready to restrain their level of tensions, they're ready to restrain their provocative acts and that perhaps we are seeing our pathway to sometime in the near future having some dialogue," continued Tillerson.